A genius idea for the math maven, this silk tie is chock-full of numbers, symbols, and equations. Putting on this tie might just make you smarter, if you can decipher the code that is. Chock-full of numbers, symbols, equations and lines, this Math Formula Tie makes a great Father's Day or birthday present to men everywhere. White writing on blue background lends the look of a chalkboard or a stack of blueprints, and will make the wearer feel like the next Einstein. Designed by artist Artist Josh Bach. Hand finished in New York. One day, Josh Bach looked down and realized that neckties are like blank canvases, and decided to infuse this classic men's accessory with wit and whimsy. Each of his eye-catching ties is designed to speak to its wearer's interests, whether he's into sports or stocks, music, or mathematics. "When I founded my company over twenty years ago, I was one of the few pioneers of 'thinking locally,'" he says. " I love living and working in New York and immediately realized that New Yorkers are creative, talented, hardworking, and skilled craftspeople—why not employ them and help the local economy?" Since 1993, his neckwear has been designed, printed, and sewn in the Big Apple. Please note, the formula on the is for MOSFET Transistors. MOSFET transistors are the core of today's integrated circuits (ICs). Originally computers usedmechanical switches to solve Boolean operations. But the smaller, faster, cooler MOSFETtransistors allowed computers to evolve into the sophisticated machines we know today. I was crusing the internet and found Uncommon Goods. I am so glad I did! My son is hard to shop for and I found the perfect gifts for him! I bought this for my engineer brother-in-law as a gift. 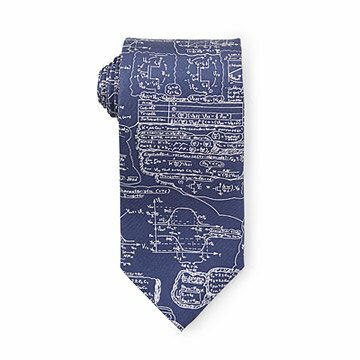 I would buy this tie for other math geeks. My son really liked the tie. He is an applied math major and he feels he could wear the tie on a second interview. Great gift for the calculus teacher!! It was exactly what I thought and wanted.